Crate training is perhaps the number one management tool that can help a dog be an enjoyable member of the family. Many people still argue that crating a dog is inhumane, cruel, or makes the dog feel isolated from the family. I would argue exactly the opposite – it was successful crate training that helped my dog become the well-adjusted, happy-go-lucky, welcome-anywhere-we-go dog that I consider her to be! Every morning, my two dogs race to their crates, anticipating breakfast. Thanks to repetition, routine, and consistent reward, “In your crate!” and “Breakfast” are now two of their favorite words in the whole world. In fact I have to be careful not to utter the word ‘crate’ accidentally or they’ll run to their crates in anticipation of the next meal. I fed them in their crates since they were babies, and they picked up on the routine instantly. The crate became a safe haven for travel in the car, getting their favorite treats, sleeping at night while the dogs were young, and of course mealtimes. I used it religiously as a house training tool, cycling each dog from the crate directly outside for a potty break, and then directly inside for a supervised play session with one of their favorite humans. Both dogs were house trained in record time and have never had an accident in the crate that wasn’t from an unexpected illness. Over the past few years, I’ve been able to take my dogs to family events, friend’s houses, hotels, rental cabins, and numerous other outings because they had become so well-adjusted to their crates. Never have I experienced the anxiety that so many pet owners experience about traveling. My dogs love to be on the road, and when we get where we’re going, I’m always sure to set up their vacation homes there too! When it came time for Cosmo to have her first knee surgery, she had to be confined to a crate for what seemed like an eternity. The only breaks for weeks were the escorted potty breaks straight to the front yard on leash and straight back to the crate. I followed the doctor’s instructions to the letter. Crate confinement was absolutely crucial to successful recovery from the surgery. I couldn’t believe how many other pet owners I spoke with over that 6 month period that had also gone through the same knee surgery. When the doctor suggested crate confinement for 6-8 weeks, they laughed. They had dozens of excuses whey their dog simply could not be confined – for fear of destruction, self-mutilation, or escape. Instead, I heard about dogs that ran free, jumped up and down off the couches and beds, and raced around the house just days after surgery. Despite the extreme expense of orthopedic surgeries, even the most inexperienced dog owner should question the sanity of allowing an animal to bear full weight and run freely on a leg that is completely compromised! I firmly believe it’s the owner’s responsibility to not only care for their dog during and after surgery, even when it doesn’t seem convenient, but also while the future needs for crating remain unforeseen. Training your dog to be calm and relaxed in a crate is perhaps the kindest and most humane thing you’ll ever do for him or her. You may not wish to crate on a regular basis, but you really never know when your dog may need to be crated out of necessity – whether it’s for surgery (even a simple spay/neuter or dental surgery), boarding, traveling by car or air, or for a temporary visit in a shelter because of a house fire, natural disaster, or simply running out of the yard to chase after a wild animal. Spend some time getting your pup used to a crate, and you’ll never have undue stress should any of these events ever occur. As we approach the possibility of Cosmo’s third knee surgery, one of the bright sides of the situation is that she can tolerate the crate confinement and will not be anxious, depressed, or stressed any more than necessary. I’m so thankful for this. K9 Kingdom offers a fun, safe, social group play environment for dogs enjoying our Doggie Daycare and Boarding services. Owned and operated by Christin Bummer, K9 Kingdom is a full service pet care facility. We cater specifically to dog owners who love to spoil their pets and treat them like family members. Cosmo is a 5 year old Entlebucher Mountain Dog loved by Christin who loves to run, fetch, and play Frisbee like no other. She’ll continue to visit the fabulous orthopedic specialists at Pittsburgh Veterinary Specialists and Emergency Center (PVSEC) until she’s healed once again! K9 Kingdom is located in Wexford, PA and serves neighboring communities such as Cranberry, Bradford Woods, Allison Park, McCandless, and north Pittsburgh. 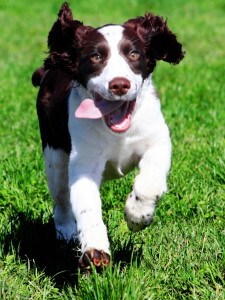 Contact us today at 724-935-DOGS (3647) or visit our website at myk9kingdom.com for more information.